Female Pirate 1 Cardboard Cutout Standup Prop - Dino Rentos Studios, INC.
Aargh mateys! You'll be walkin' the plank with this Female Pirate 1 Cardboard Cutout Standup Prop! Perfect for any pirate or renaissance themed party or production. 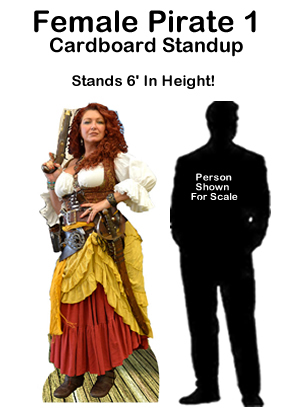 Female Pirate 1 Cardboard Cutout Standup Prop measures 6ft tall x 32" wide.